Happy Family House Scores -13 HERS Score! An adaptation of architect Arielle Schechter's (https://www.acsarchitect.com) Happy Family Micropolis Home Plan has scored a super impressive -13 HERS score. Our preferred partners for Energy Rating, Southern Energy Management (https://southern-energy.com), provided the third party verification of HERS rating. For those unfamiliar with HERS ratings, a -13 score indicates that the house should be net positive. Net positive is what you do when net zero is just not good enough anymore! Newphire Building has two homes on the upcoming Green Home Tour. The tour takes place on April 28-29 and May 5-6 from 12-5 p.m. It is a self-guided, free tour. Visit the link below to see where you can pick up a tour guidebook. Both homes are designed to be at or near net zero energy. For more details and to see our work in person, please consider coming out for the tour. Sarah worked on Brad Pitt's post Katrina homes for years down in New Orleans before moving to Carrboro. Check out a link to her website below. So you want a super tight house, but you still want your pets to have access to the outdoors? What to do? Traditionally, you go to a big box home improvement store or a pet store and buy a pet door that is the equivalent of hacking a giant hole in your house. Kind of sad after you have spent months chasing down every minute hole in your house. Now there is an alternative. An airtight pet door, made in the U.S.A. Freedom Pet Pass energy efficient pet doors. Kevin Murphy of Newphire Building has been featured in the July 2015 issue of the Journal of Light Construction (JLC). JLC is an industry leader in the field and features high quality building techniques and products. The article that Kevin is quoted in pertains to the Conditioning Energy Recovery Ventilator (CERV) by Build Equinox, of Urbana, Illinois. Read the article here. This is what it looks like when an architect pays attention to orientation and overhang! 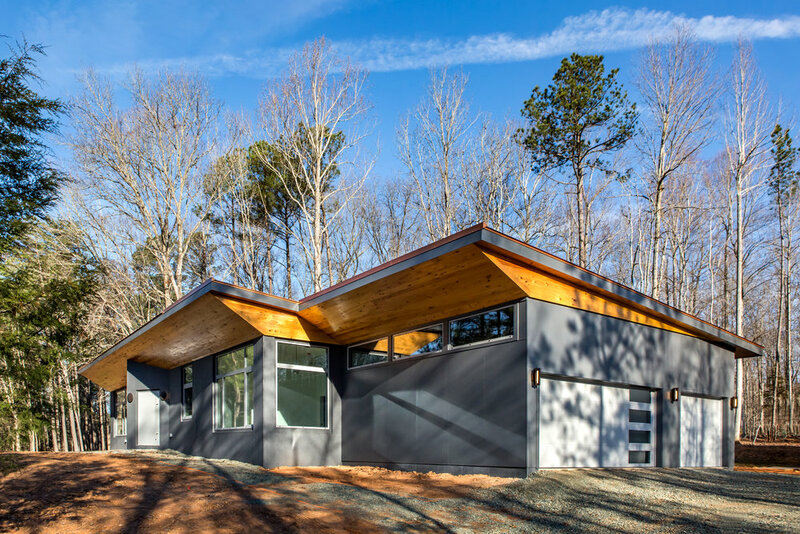 The architect in this case, Arielle Condoret Schechter, worked with Newphire Building to optimize passive solar heating and cooling by orienting the house properly on the site and by specifying beefy overhangs that protect the home from the elements. The overhangs keep all but the most extreme wind driven rains off the wall assembly reducing the opportunity for water damage. They also help out with energy efficiency as they keep the sun's warmth out of the house when you don't want it. Cooling is more of a challenge in our super insulated, super tight homes than heating, so it is good to have the house working as a system. This photo was taken at around 1 p.m. EST on July 26th. Pretty much mid day, mid summer. You can see that the shadow line from the overhang falls almost perfectly at the foot of the wall. Super-Insulated Construction Techniques -- Newphire's not a one trick pony! At Newphire, we're dedicated to providing our customers cutting edge performance and energy efficiency. The constant is a super tight, super insulated envelope. By keeping the air leakage to a minimum and the insulation to the maximum, our homes are far more durable and less expensive to operate than an average new home. The result is a home that is relatively easy to make into a Net-Zero Energy Home (a home producing as much energy as the home uses) with a comparatively small solar PV array. Stick built- we have devised a cost-effective system for stick building that meets the stringent Passive House standard for our climate. It was designed in a collaborative effort with architect Jay Fulkerson and is referred to as the "jayPhire" wall. Stick building is obviously a system that all of the trades are comfortable with. Pre-Cast Concrete- Our favorite precast concrete provider is Ideal Building Systems out of Durham. They are very flexible and will work to accommodate any plan as much as possible. They have collaborated with us over the years to make their wall system a better fit for our needs and for the needs of our clients. Insulated Concrete Forms- ICFs are recognized as a proven way to build a super tight, very well insulated house. They can also provide a very secure structure that can keep you safe from storms or the zombie apocalypse... Our favorite ICF provider is Quad Lock. Their system is very modular in nature and is easy to work with. One of the cool options that they provide is the ability to make the roof and floor systems out of concrete in addition to the walls. If there was a giant storm coming, there is no other building that I would want to ride it out in. Want a log cabin that is super efficient? Seems like an oxymoron, but we have recently discovered a system that can provide just that thanks to an interested client. The company is called Timber Block. 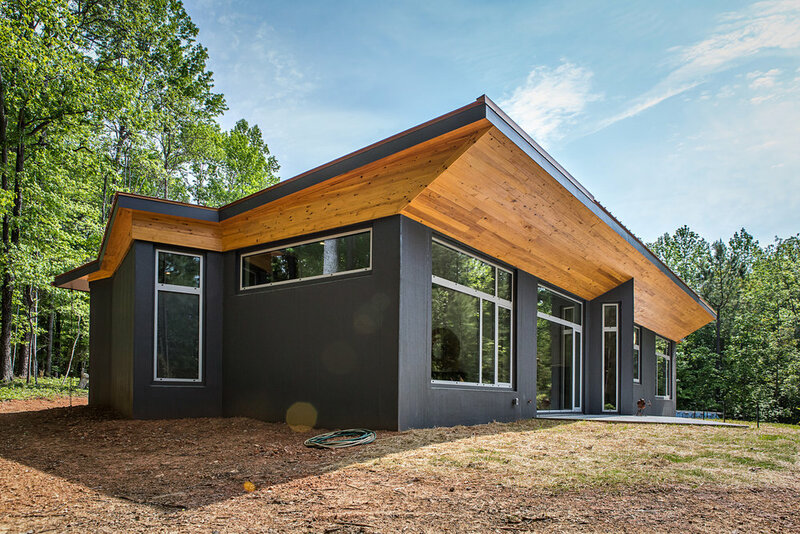 They provide a panelized, heavily insulated wall assembly that has all the beauty of a log home without the leakiness and lack of stability associated with a traditional log home. For us, this is the opposite of the old saying that it is about the journey, not the destination. In this case, it is about the end result- a super insulated, super tight, net zero certified Passive House Plus. We can get there by any number of paths, all with their own merits. Let us know which wall assembly is right for your project! Thanks to all the folks that came out to the Happy Meadows Courtyard House over the past two weekends! It was undoubtedly the most well attended tour ever. 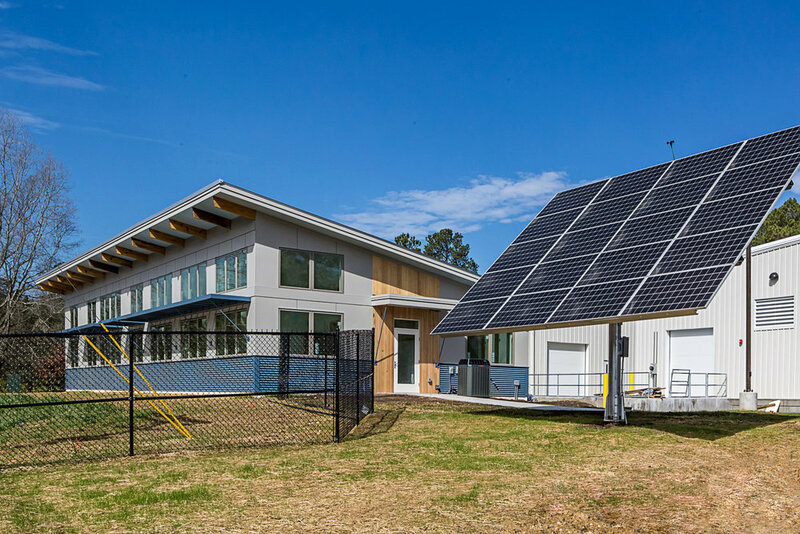 It says a lot about the beautiful, modern design by architect Arielle Schechter, and the abundance of green, energy efficient features packed into the net zero house. The biggest thanks go out to the gracious homeowners who allowed hundreds of people to explore their house and grounds for 20 hours over the last two weekends. Finally, thanks to the Home Builders' Association of Durham, Orange Chatham for organizing and marketing this event. It is important for both the public and the builders for everyone to get a chance to get together and meet. I, as a builder, feel so fortunate to have an opportunity to meet prospective clients face to face and demonstrate what makes my company unique. Looking forward to having a couple of net zero homes on the tour next year!